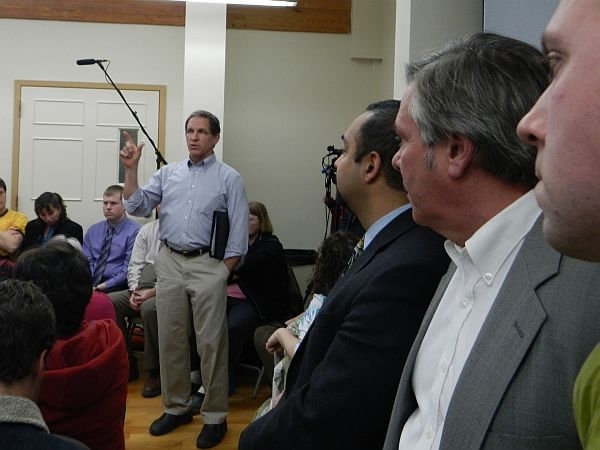 (Host) Last night, an overflow crowd filled the Lamoille Community Connections conference room in Morrisville. About 150 people were there to hear Vermont Mental Health Commissioner Patrick Flood talk about a plan to put up to 16 beds at the regional mental health facility. Flood said the arrangement would be only for a few years, until a new state hospital can be sited and built. (Flood) "But I draw the analogy, or the comparison to what we’ve had to do with a lot of our roads. I mean we went in and we fixed roads quickly to make them passable, and folks from transportation will tell you we’re going to have to go back and tear some of that up and do it again, just because we had to deal with and emergency. So I think it’s just a by-product of the situation, the emergency we’re in." (Host) Lamoille Community Connections is a daytime facility in a mixed residential and commercial neighborhood. The facility’s zoning permit prohibits housing overnight residents. But since the State Hospital was forced to close after Irene, Vermont has had a critical shortage of beds for mental health patients. That necessity, state officials say, supersedes any local permit restrictions. The Lamoille Community Connections Board must now decide whether to lease part of it’s building to the state. As a former nursing home, state officials say the building is uniquely suited to serve as an overnight facility for the northern part of Vermont.